"The rugged cliffs of the isle of Capri Italy will make it very easy to believe it was exactly here where the seductive sirens called and sang to Odysseus’ sailors..."
The whole area of the Bay of Naples Italy, not just the isle of Capri Italy, is the stage of many a myth and legend. And myths and legends, taken with a lot of reserve, are the only clues to what might be actual historical facts from times from which none or very few written records exist. Some of those myths and legends are recorded in works of Homer and Virgil and the adventures of their heroes Ulysses (Odysseus) and Aeneid. They tell us about times when the race of cannibals, the Laestrigonians conquered the isle of Capri Italy and the neighbouring islands: Pontines, Ischia and Procida. Not far away from here is also Cumae, where Sybil showed the Aeneas the way to the underworld. On the spot of today’s Naples, more precisely at the spot of today’s Castell Ovo, used to stand an ancient city called Parthenope. Parthenope’s image has since been one of the symbols of the city. 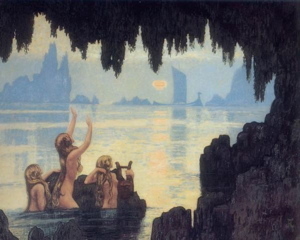 And this introduces us to the sirens and the importance they have for the isle of Capri Italy and the whole area. Namely, it’s the area between Sorrento, Amalfi and Capri where these mythological creatures lived. Ancient descriptions depict them as birds with beautiful human heads. The fact that their images are often found on ancient Greek tombs tells us they might have been funerary deities. It was the Romans who started looking at them as sea deities more and depicting them as mermaids. The three islets off the coast of Amalfi, Li Gialli, are one of the places that have been identified as the haunts of the Sirens. In the old nautical maps these islands were marked as Le Sirenuse. It is even said that the name of Sorrento derives from Surrentum, from the Sirens. But the fact that in literature sirens are described as dwelling on a flowery meadow stretching out to the sea, somehow plays to the advantage of the flat topped Scoglio delle Sirene, or Sirens’ Rock at the Piccola Marina on the isle of Capri, Italy. The rugged cliffs of the isle of Capri Italy will make it very easy to believe it was exactly here where the seductive sirens called and sang to Odysseus’ sailors. To prevent them from being shipwrecked on their island he had the sailors ears plugged with wax and had himself tied to the mast. He warned the sailors not to untie him no matter how much he begged. And that’s how the cunning Odysseus and his crew managed to escape being shipwrecked on the Siren’s island and imminent death.